Nov 4, 2016 | 1 Votes by shilpa 10 rate Your vote Parents in this modern era have already embraced educational games as being a part of their child's educational journey, but most teachers are still a bit hesitant. Thus, in this article, we list out some benefits of educational games in the classroom, and hopefully, may change the minds of the teachers out there. In today’s world, almost all activities in life involve the usage of an electronic device or the internet. Whether it’s buying new clothes or checking the soccer score, the digital realm is there for it all. With the internet taking over every sphere of life, it is vital for educational institutes like pre-schools and schools to get their students acquainted with it. The process of learning is long drawn. One learns properly when one invests good amount of time and concentration into a particular subject. As a teacher, there are a hundred different ways in which you can help your student learn. Using educational games in class is one of the methods. Everybody loves to play games. There is no age limit or barrier to it. Video games are an integral part of peoples’ lives. There are thousands of genres of games to choose from. With the passing of years, games are becoming more and more realistic. Developers are creating games that can be used as learning tools for children. 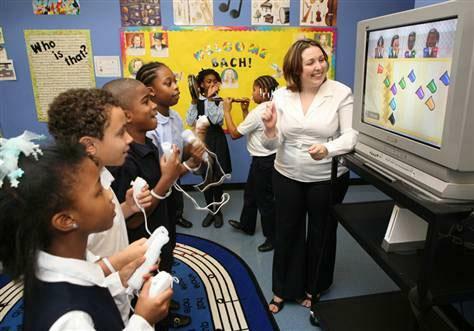 Usage of educational games in the classroom is a very new trend in the States and other parts of the world. Every child is different. Some concentrate on what is being taught by the teacher and some tend to enjoy the world outside the window. Some kids are naughty and some are very quiet and peaceful. The only common factor is all kids love to play video games. You as a teacher should take advantage of this situation and help your students learn in a more fun and engaging way. Most video games out there require the complete attention of the player. It takes the player into its realm. Educational games out there have a lot of puzzles and problem solving inside them. Sometimes the game requires the child to memorize some things. These factors not only enhance the child’s concentration, but also improve his or her memorization capacity. The effects last for quite some time too, making it ideal for teachers to add in short games-related sessions (perhaps games that can test the students on their understanding of the subject matter) in between lessons. Almost all jobs in the world today require some level of computer fluency. Since technology has reached its apex and almost all spheres of life require the help of the digital realm, it necessary for everybody to have computer fluency. Schools have computer classes which teach the students about the computer and how it works. In addition to these classes if the child is allowed to play educational games in class, he or she will pick up the subject matter and usage a lot quicker. Playing educational games from an early age will not only improve your student’s cognitive skills but also his computer fluency. Games require the child to think on his own feet. He or she has to make difficult decisions in the game through usage of logical and analytical reasoning. This will enhance your student’s cognitive thinking and strategic thinking abilities. Every educational game has a ton of puzzles and problems and levels to overcome. These aspects of the games help your student improve his or her problem solving skills. Most games out there require the simultaneous and spontaneous usage of hands and eye. You have to keep your eyes on the screen while you type or use keys from the keyboard. When your student plays a particular game, he or she has to be able to maintain this proper flow and hand and eye usage. This enhances the student’s hand eye coordination and makes him or her a lot more comfortable with the computer. It’s difficult enough to get a restless child to sit still for a few minutes, let alone to sit through hours of classes in school. Educational games today have a lot of aspects imbibed in them that can combat this. These games help the child learn about various subjects like math, science, social science, English, world history and many more in a fun and engaging way. Most students would find a 40 minute lecture on Greek History boring. If the child is allowed to play a game which indirectly teaches him or her about Greek history, he or she will learn it a lot faster. Your child may indirectly improve his/her vocabulary skills by playing English games as well! A lot of children in the world today suffer from attention disorder and other mental disorders like autism or ADHD. It is very difficult for these types of special needs students to pick up what is being taught to them in a traditional classroom setting. Educational games are a big help in this scenario. With specially-designed gameplay fitted to the needs of these children, as well as the usual bright colors and funny characters, the children will be able to learn a lot faster and in a more efficient (less tantrums or outbursts) way. Now, we are not suggesting that spending 12 hours a day playing video games even if they are educational games is good for your child. After all, video games, if played for long can distract your child and add some stress to the eyes and brain. However, proper usage of educational games in class, on the other hand, will help your kid learn a lot more efficiently.